Chip is Rockwell A5300PA, here date coded end of 1974. 76 x 153 x 23 mm (3.0" x 6.0" x 0.9"). Country of manufacture: England or Mexico, or both, see labels below. 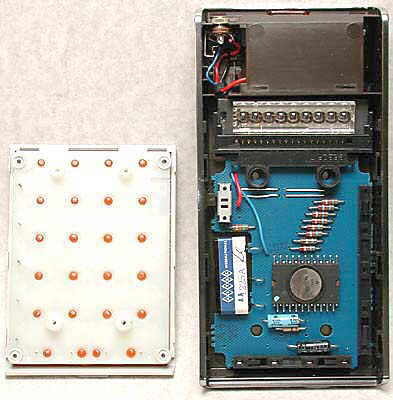 Inside, showing the circuit board and the keyboard, which plugs in. 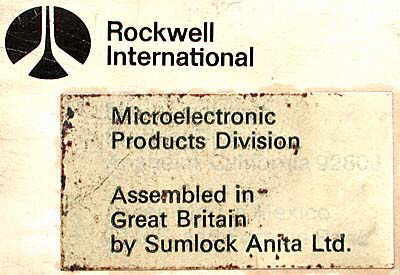 A label stuck on the back of the box says "Assembled in Great Britain by Sumlock Anita Ltd. 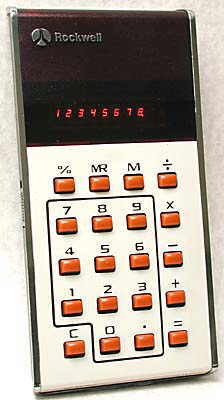 This was one of a series of Rockwell hand-held calculators launched as "The Answer". 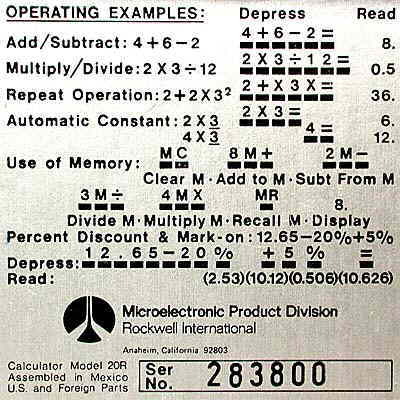 The label on the back of the calculator says "Assembled in Mexico. U.S. and Foreign Parts". Maybe both of these labels are correct. To reduce import duties it is possible that the circuit boards were assembled in Mexico, and were then delivered to England, together with the case and other parts, for final assembly there.